As Apple iPhone 7 Plus users know, sometimes a new feature runs late and you have to wait for a software update to receive it. That happened with the Portrait Mode that produces the professional looking blurring effect on portraits snapped with the camera, also known as bokeh. The software needed to create the effect didn't ship with the iPhone 7 Plus, and appeared with the first iOS 10.1 beta. According to tech tipster John Gruber, this could be how Apple will disseminate the necessary software to enable wireless charging on the 2017 iPhone models. In a tweet posted yesterday, Gruber notes that Apple is possibly having issues with the feature and it might not be available until iOS 11.1 is released. The Apple iPhone 8, Apple iPhone 7s and Apple iPhone 7s Plus should launch with iOS 11 pre-installed. Gruber's tweet also mentions that the wireless charging hardware will not be included in the box with any of the three new iPhone models expected to be released later this year. That leaves it up to the consumer to decide whether this is a feature that he/she wants to pay for to employ on the device. Earlier this year, we passed along a rumor that the wireless charging components are being sourced by Apple from Lite-On semiconductors. 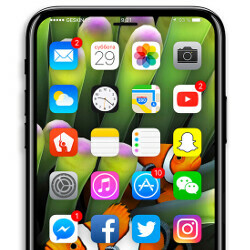 Apple also has a connection with Energous which led to a rumor that the new iPhone units will be capable of charging wirelessly from a distance of 15-feet. That would be a major improvement over current technology. Sold separately? Hahah apple wants to earn more money. They are 6 years late with wireless charging! Doubtful, if the internal portion was ready then so would the external. The likely conclusion is that Apple will release a case with wireless charging capabilities. One thing is for certain, that one idiot that was claiming that Apple will revolutionize wireless charging, AMOLED and in screen FP sensor is probably going to spin this like Fox news on steroids. This is BS. Apple like to make money off of their accessories. More money in the long run. Pretty sure it’s going to be internal, a wireless charging case only makes sense for the smart battery case. Yes there needs to be software to control the wireless charging ehich is probably what’s running late. Pretty sure this isn’t run of the mill gimmick charging pads like we have currently. lol sheeple actually thinks that Apple is going to offer superior wireless charging. Apples wired chargers already take hours to fully charge an iPhone. Their wireless solution will probably take a day or two. Takes me about an hour and 10-15 to charge my + with a 2amp charger from Apple. Given that my battery lasts 1.5 days and I charge while I’m asleep, or working, I don’t see the problem. Same went for my LG temp device several years ago. Samsung doesnt include a wireless charver for their phone in the box either. So i dont consider that a strike. And this new charger probably will take longer to charge if you are at tbat 15ft mark. So it wont even be worth investing for. Because you know Apple is gonna charge $99 for it. While Samsung's fast wireless charger, which charges and S7 edge from zero to 100 in 108 mins, but only cost $70. The 7S is likely just gonna be a iPhone 7 with a faster cpu and sane design foe 4th year, which will push the sheep into buying thw new model instead. First of all. How many smartphone brands out there that has wireless charging technology? Does it reach a 100 to be considered as a standard charging technology for all smartphones? Second. Even samsung doesn't include the wireless charging dock in the package. So samsung is also earning more money by selling it as a separate purchase. Third. Apple has an existing functional wireless charging technology. Where do you think the apple watch would charge from? So designing a wireless charging technology is hard you know! Reported for being too logical. You can’t have that kind of logic around here!!!!! Uh oh...you know who's gonna have a stroke after reading this article. Isn't wireless charging a hardware feature? So how would a software update make it available? Its kind of like when iOS 8 or whatever updated the iPhone so it can be charged in the microwave. It means the software update is to enable wireless charging in the iPhone. I know what you're saying, but if the iPhone doesn't have the hardware for wireless charging, then what is a software update going to enable? The phone has the hardware, the charging pad won't be out at launch. So, they'll have the hardware inside the phone disabled via firmware. Maybe just like they updated Bluetooth through software. Why are you comparing last years iphone? Clearly. The latest would win. So why don't you compare this years iphone? Just do the type that's currently available. I'm just not getting any news to get me excited for the iPhone 8.